Haven't you had days like this one? I sure have! After I posted this "Bad Day" ram photo on August 22 I had requests to put the image on a t-shirt. So, here you go! 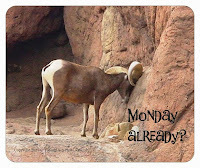 This 100% cotton t-shirt says, "Monday Already?" Price for this conversation-starting shirt is just $16 which INCLUDES shipping (continental US only). 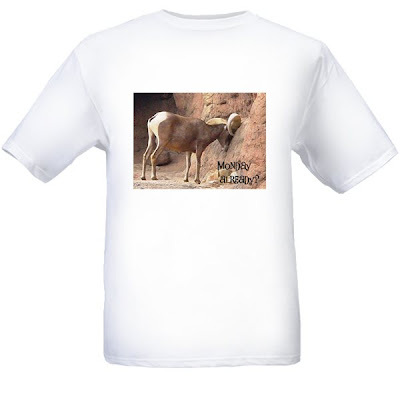 Part of that money goes to charity because ~ for every shirt sold I will make a $2 donation to the Arizona-Sonora Desert Museum (the permanent home of this expressive ram). How to get one of your very own is simple! 1/Go to Paypal (http://www.paypal.com/) and click on the link to "Send Money." 2/You will then input this email address: Diannewoof@yahoo.com to complete the transaction. I will make every effort to ship the same day or the next day at the latest. For now I'm offering the shirt in the ever-popular "Men's Large" size. I plan to offer other sizes if the response is good. Please send this link to anyone you know who might enjoy this fun shirt. Thank you! I remember that image and love this t-shirt! I'm going to order one - thank you!